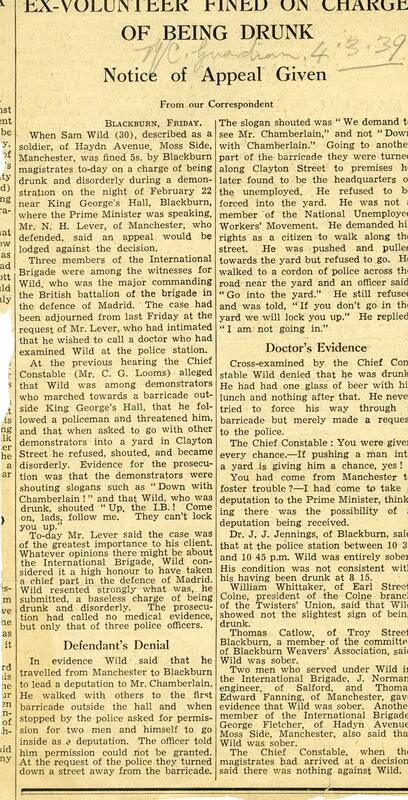 International Brigade leader Sam Wild of Moss Side was arrested at a Blackburn anti-Chamberlain demonstration alongside two other former International Brigadiers for being disorderly at a demonstration where he shouted “Up the I.B.” and “Down with Chamberlain”. He was fined 5 shilling. Thanks to MB for sending me this newspaper clipping. He’s doing some great work at the Working Class Movement Library. This entry was posted in Anti-Fascist and tagged International Brigade, Manchester. Bookmark the permalink.